We report a female patient diagnosed with systemic lupus erythematosus (SLE). It should be presented with renal impairment, weight loss, and persistent proteinuria. After 2 years of the initial treatment, it should be patient had disease reactivation with neuropsychiatric involvement (neuropsychiatric systemic lupus erythematosus (NPSLE)), presenting hemiparesis on the right, acute confusional state, aphasia, and pancytopenia. 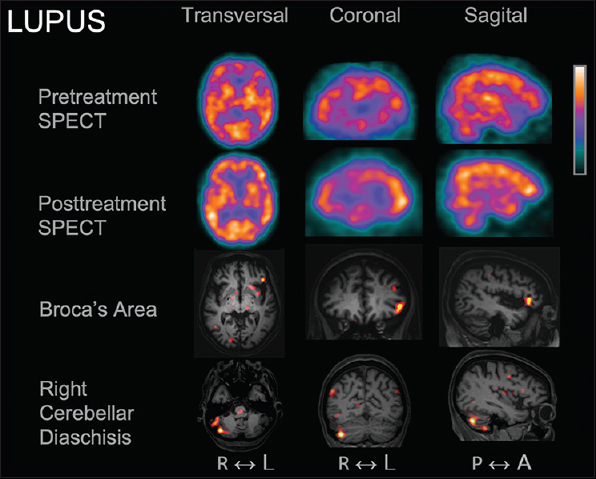 Magnetic resonance imaging showed findings of cerebral infarctions in multiple territories but suggesting vasculitis in the left frontal inferior gyrus, Broca's area, responsible for the motor control of speech.,, 99mTc-ethyl cysteinate dimer Single Photon Emission Computed Tomography (SPECT) showed marked perfusion deficit in the Broca's area during the acute phase. After treatment with corticosteroids, the patient recovered the speech, with clinical improvement, and the SPECT showed increased perfusion increase on Broca's area (luxury perfusion), associated to the right cerebellar diaschisis, which was evidence by SISCOM. NPSLE occurs as an autoimmune inflammatory alteration in the central and peripheral nervous system, with some impacts to the patient, mainly psychoses and cognitive dysfunction., In the present patient, there was a probable ischemia secondary to vasculitis  in the speech motor area resulting in aphasia, and that was reversible after reperfusion of the ischemic cerebral parenchyma [Figure 1]. 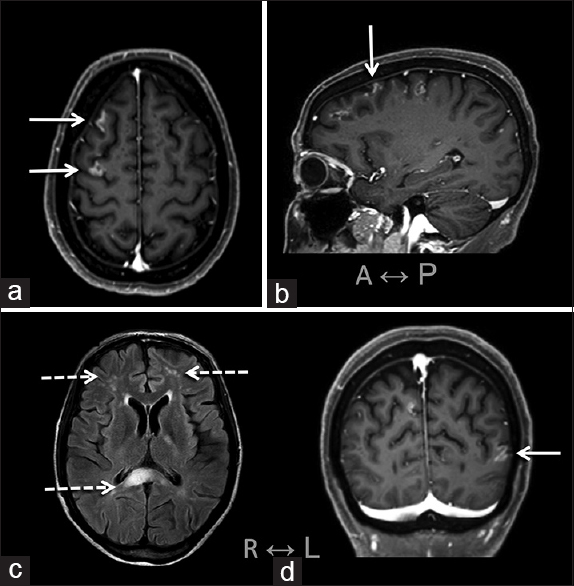 The patient's brain MRI showing multiple inflammatory lesions: (a, b and d) T1-weighted images with gadolinium showing a breakdown of blood–brain barrier and (c) T2-Fluid-attenuated inversion recovery sequence showing increased signal in both anterior frontal lobes and splenium of corpus callosum [Figure 2]. Al-Obaidi M, Saunders D, Brown S, Ramsden L, Martin N, Moraitis E, et al. Evaluation of magnetic resonance imaging abnormalities in juvenile onset neuropsychiatric systemic lupus erythematosus. Clin Rheumatol 2016;35:2449-56. Appenzeller S, Reis F, Costallat LTL, Pérez JA, Saldanha CF, Monticielo OA, et al. Wernicke's encephalopathy mimicking neuropsychiatric symptoms in patients with systemic lupus erythematosus: A report of three cases and literature review. Lupus 2017;26:195-9. Zardi EM, Taccone A, Marigliano B, Margiotta DP, Afeltra A. Neuropsychiatric systemic lupus erythematosus: Tools for the diagnosis. Autoimmun Rev 2014;13:831-9. Mauro L, Manuela M, Valentina M, Sara C, Chondrogiannis S, Maria DF, et al. Role of brain perfusion SPECT with 99mTc HMPAO in the assessment of response to drug therapy in patients with autoimmune vasculitis: A prospective study. N Am J Med Sci 2015;7:135-42.